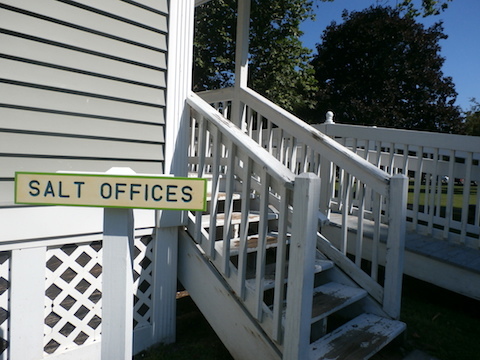 Above: The sign outside SALT's offices in the Schoharie County village of Schoharie. Photo by Timothy Knight. When Hurricane Irene and Tropical Storm Lee shattered communities in the Catskills in August 2011, the flood recovery group Schoharie Area Long Term Recovery (SALT), which serves the Schoharie Valley, sprang up to help in one of the areas hit hardest by the storms. Five years later, SALT has accomplished its immediate post-flood mission. According to Sarah Goodrich, SALT’s executive director, the organization met its immediate goals by bringing in funds and rebuilding homes for flood victims in the aftermath of the disaster. SALT coordinated 36,000 volunteers, “leveraged” $7 million and raised $2 million after the disaster, according to Goodrich. "We helped over 600 families," she said. But now the recovery organization is facing new challenges: falling revenue due to slackening donations and a complaint to the AmeriCorps VISTA program over the use of volunteers. Underscoring those logistical problems is a larger question: What role does a flood recovery organization have in a community when the disaster is over? According to publicly filed IRS-990 financial disclosures reviewed by the Watershed Post, SALT has seen its revenue streams decrease steadily year by year since 2012. Meanwhile, in the past year, two of the organization's primary fundraising events have either been cancelled or dramatically pared back. After taking in just shy of $700,000 in overall revenues in 2012, that amount plummeted to slightly above $265,600 overall revenue in 2014, according to the organization’s tax filings. In that same time period, SALT's net assets dwindled from $496,564 to $216,406. The organization’s expenses have risen even as its income has fallen. Starting off with only $204,782 in overall expenses in 2012, that figure ballooned to $673,568 at the height of flood recovery efforts in 2013 before falling to $477,000 in 2014. Above: SALT'S offices. Photo by Timothy Knight. Additionally, SALT’s tax fillings show that employee-related costs—including salaries and benefits—accounted for approximately 46.5 percent of the organization’s overall expenses in 2014. Stephanie Kalivas, an analyst for the national watchdog group Charity Watch, told the Watershed Post that disaster relief charities typically spend 80 percent of their disbursements on program-related costs, but cautioned that salaries are part of the program cost equation. When asked about their employee-related expenses for 2014, Goodrich explained that as SALT transitioned from addressing its immediate goals towards long-term recovery, staff resources were put towards applying for grants and development even as other expenses and revenues decreased. Despite multiple requests, the Watershed Post has been unable to obtain SALT's most recent IRS-990 financial disclosures for 2015. The forms have in the process of being audited since early June. SALT is primarily supported by fundraising, and its finances have taken a hit as the Schoharie Valley community has given less to the organization in recent years. Lack of community support last fall led to the cancellation of SALT’s Savor Schoharie dinner fundraiser, and this summer SALT significantly pared back its annual Bounty of the County fundraiser because of a lack of volunteer capacity. In 2014, Bounty of the County was a two-day foodie event featuring a multi-course dinner, cocktails and a farmer’s market. This summer, it was a day-long artisan’s market. When asked to comment upon the group's fiscal viability, Goodrich said: ”I think we are as stable as we can be right now." SALT has also gotten into trouble with the organization's use of AmeriCorps VISTAs, a group of federally managed volunteers who commit to one-year terms of service in American communities. Five VISTA members, most young adults, have worked in SALT’s office in 2016. SALT is currently advertising for four new positions, according to their website. Apparently, not all of the volunteers have been pleased with the experience; SALT has been reported to the state AmeriCorps office for improper use of VISTAs, a fact that Goodrich acknowledged. With the contract between SALT and AmeriCorps ending next summer, Goodrich commented that SALT will not be seeking an extension of the program. Goodrich said that state AmeriCorps office checks in on all volunteer venues two to three times yearly, and added, "I like that kind of transparency and openness." "Recovery really is a very long-term process," Goodrich said. Now that the flood is over, SALT has had to shift its goals, redefining “recovery” as the ongoing process of building community in the region. Part of that vision is preparedness. SALT has been included in the Schoharie County Office of Emergency Management's plan to coordinate volunteers and a network of volunteer sites in case of another disaster. But SALT also has several new community-building projects. The organization is conducting a year-long feasibility study for a potential 38-mile trail along the Schoharie Creek in a bid to strengthen the regional trail system and to increase local recreational opportunities. SALT is also dabbling in tourism promotion. The organization is developing a “Geo-to-Go” augmented reality mobile app and website to promote Schoharie County’s art, culture, history and recreation. Josh DeBartolo is the former director of the now-defunct flood relief group Schoharie Recovery, which merged operations with SALT in October 2013. He believes that SALT has a viable purpose moving forward. "There's absolutely a need for an organization like SALT to do what SALT is doing," said DeBartolo. Matt Avitabile, the mayor of the Schoharie County village of Middleburgh, agreed, but added that he thinks that the organization should have no paid staff, and should be run by volunteers only. “With limited resources for flood recovery, it's important to use them as wisely as possible," Avitabile said.